King’s Shigeyuki Kinjo mounting an offense. 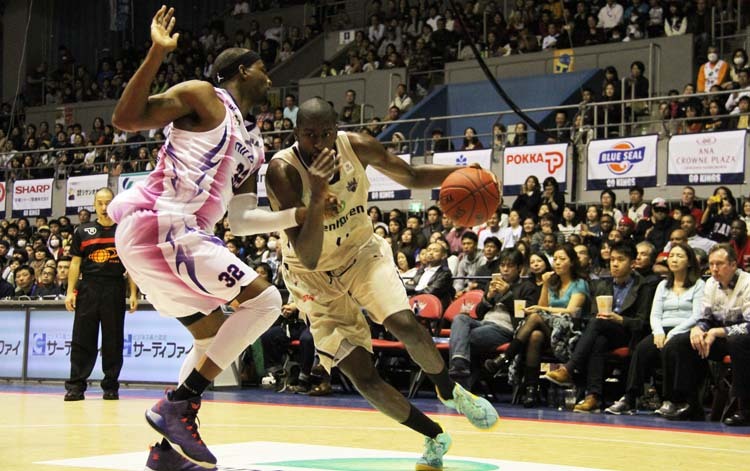 Chalk it up: the Ryukyu Golden Kings are more than fired up, extending their unbeaten streak to ten straight, while dominating the Basketball Japan League’s Western Conference with a 16-2 record. Draelon Burns and Anthony McHenry are the faces behind the pair of powerful victories over the Fukushima Firebonds in front of the home crowd at Ginowan Gymnasium, where Okinawa won 108-75 on Saturday and 86-73 on Sunday. In the series opener, Burns and McHenry each scored 18 points, backed by a 14-point performance from Ryuichi Kishimoto and a red hot Naoto Kosuge, who planted three three-pointers as part of his 11-point contribution. Golden Kings’ Anthony Kent takes on Fukushima’s Edward Morris, left. Sunday was more of the same for the Golden Kings, although Fujita was able to inspire his Fukushima team to a bit more defense, holding Okinawa’s scoring in check while maintaining their own. Anthony McHenry’s 25 points was the game topper, on top of which he hauled in a dozen rebounds. Draelon Burns was again at the forefront with McHenry, scoring 19 points of his own. Ryuichi Kishimoto picked up 14, while Naoto Kosuge poked in another 10 for Okinawa. Elsewhere, the Kyoto Hannaryz continued their winning ways, sweeping a series against the Oita HeatDevils, 68-53 and 78-44. The victories push the Hannaryz to 18-2 and the top spot in the Western Conference, ahead of Okinawa. The HeatDevils slide to 6-12 after the drubbings. The Sendai 89ers is sitting in the Eastern Conference third place position following a pair of wins against the Nara Bambitious. Sendai won the opener 91-67, and barely hung on Sunday to win 76-75. The Bambitious are now 5-11. The Iwate Big Bulls had no difficulty handling the Saitama Broncos, hammering the winless 0-16 Broncos 96-59 and 85-71. The Big Bulls have now won 18 straight games as they sit atop the league with a 19-1 record. The Shinshu Brave Warriors took the ‘David’ role against ‘Goliath’ Toyama, dumping the 14-6 Toyama Grouses. The victories over their Eastern Conference rivals propelled them to a 7-9 record, in the middle of the league pack. 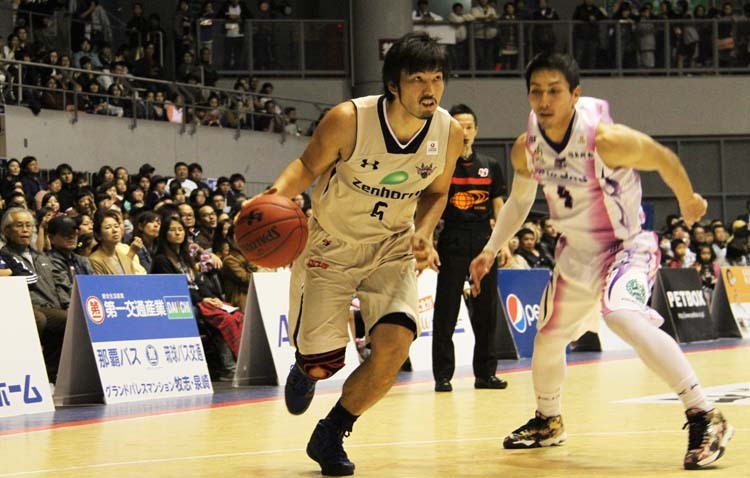 The Shimane Susanoo Magic gave the Aomori Wat’s a run for their money over the weekend, beating the high scoring Wat’s 70-60 in the series opener at home, only to lose 82-65 in the Sunday afternoon finale. The Wat’s now 11-9, while the Susanoo Magic fall to 3-17. The Akita Northern Happinetts had a happy weekend, downing the Shiga Lakestars twice, to the delight of home fans. The Happinets won the first contest 90-78, and increased the pressure on Shiga to win 80-64 on Sunday. 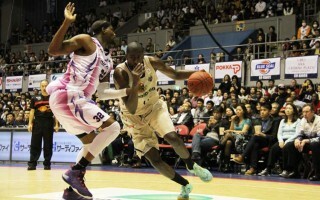 The wins put Akita at 16-4, while the Lakestars are close behind at 11-5. The Osaka Evessa also had little difficulty in tallying a pair of wins over the Tokyo Cinq Reves, winning the first series game 84-65, then maintaining the pressure against the 4-16 Tokyo squad with an 88-57 win. The Evessa are now 13-7. The Niigata Albirex BB made easy work of the Takamatsu Five Arrows, sending the visitors to their fifth and sixth straight losses. The Albirex BB won 101-83 and 74-64 to run their record to 11-9. The Five Arrows are 7-13. The Gunma Crane Thunders, likewise, had little difficulty handling the Yokohama B-Corsairs. The Crane Thunders took the first 96-63, and Sunday’s game 93-76. The victories were only the third and fourth of the year, against 14 losses for Gunma. Yokohama is also near the cellar with a 4-16 record. The Hamamatsu Higashimikawa Phoenix had no problems being on the road, roaring into Fukuoka Prefecture to beat up on Fukuoka Rizing 74-65 and 76-74. The Phoenix are now 15-3, while Fukuoka sits in the 4-16 position in the Western Conference.